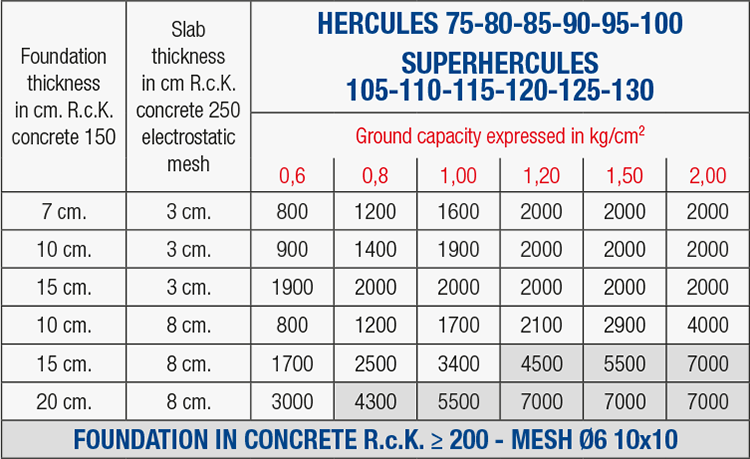 HERCULES and SUPERHERCULES were devised to satisfy the most var­ied requirements of height, in particular where the foundation beams have thicknesses greater than 70 cm. These disposable formworks are made from recycled plastic for creating ventilated crawl spaces. With HERCULES, from 75 to 100 cm, with SUPERHERCULES from 105 to 130 cm with 5 cm intervals. On the upper part of the LEG, as well as on the surface of the BASE, there are indicators (arrows) which, during the installation phase, should always be facing the starting angle. The special interlocking system between the Leg and Base allows quick installation and guarantees the robustness and stability of the HERCULES and SUPERHERCULES during the casting stage. HERCULES and SUPERHERCULES, being formworks, have been de­signed to withstand the weight of operators and concrete during the casting stage. 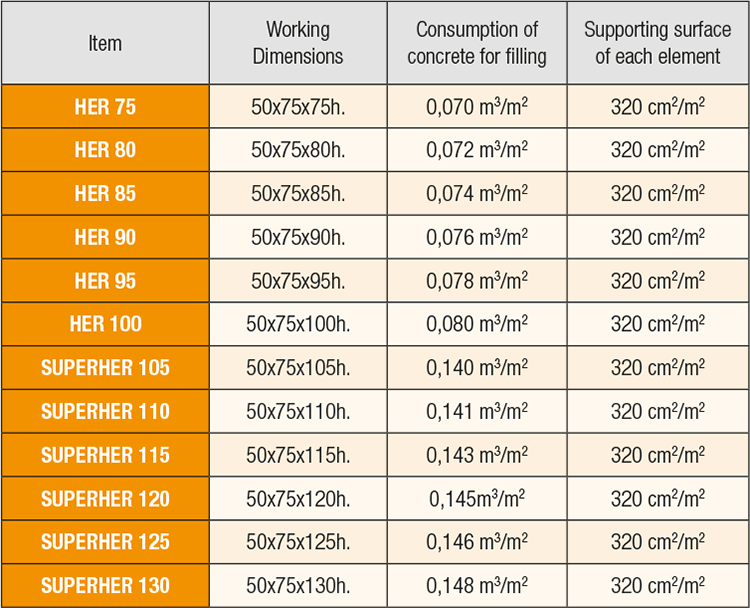 The useful load varies in function of the slab thickness and the lean concrete below. On request we will provide a calculation report for the load commissioned; certification of the maximum capacity of the land and the construction management remain the responsibility of the Technical Works manager. WITH HERCULES AND SUPERHERCULES THERE IS NO WASTE. a1) RcK 150 concrete must be used for lean concrete casting 150 cm thick. ….. For the laying the «HERCULES – SUPER­HERCULES» formworks. a2) For loads greater than Kg./m2 4000 and/or constructions in seismic áreas, the foundation must be in RcK 150 with electro-welded mesh Ø 6 10×10. b) Supply and dry laying on the floor formed of plastc «HERCULES – SUPERHERCULES» formworks, H. cm. …….. . Installation should be carried out following the arrow indicators. 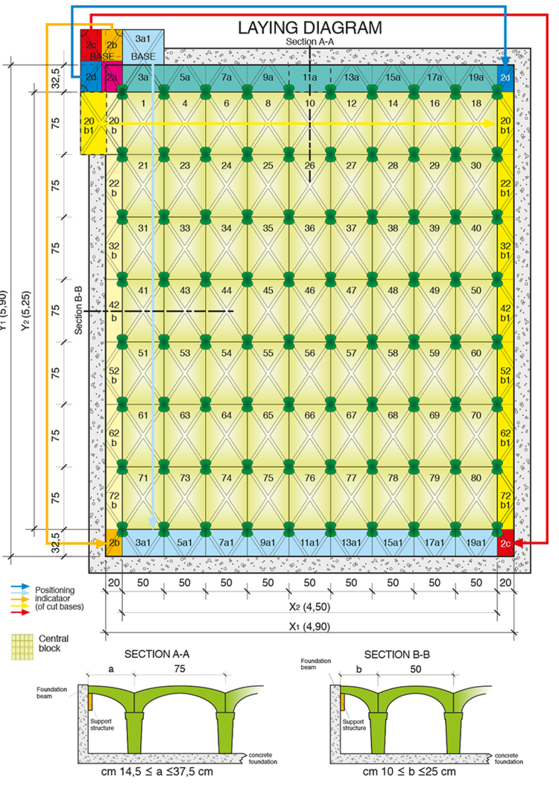 c) Supply and installation of reinforcement, consisting of welded mesh Ø6 20×20. d) Supply and installation of concrete RcK 250 to fill «HERCULES – SUPERHERCULES» and formation of slab with thickness of …cm . ……… . NB: When a floor is being made with finished casting, the concrete should be cast in two phases: the first for filling the legs and levelling the element and the second for making the flooring slab. After this, the “EXPANSION JOINTS” should be made, with a centre to centre distance of about mt. 4×4.